33 Weeks and 3 days! Today was another ultrasound. I thought it would be my last but it turns out I'm having another one next week. Baby A is now 4 pounds 12 ounces and baby B is 4 pounds 4 ounces, exactly 9 pounds of baby. My stomach is measuring at 40 weeks. Eek! They both have good strong heart beats, 158 bpm and 152 bpm. Also both look like they have a lot of hair. 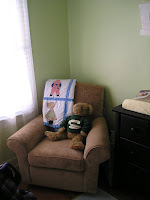 It was hard to get any good looks at anything else on the ultrasound because they are now so crammed in there. Both are still head down. There was a little concern that baby B has a little less amniotic fluid, hence the next ultrasound. they told me to get a lot of fluids this week and they will measure again. It could just be that its hard to measure any good size pockets of fluid because it's hard to measure anything with two babies. From now on I will be getting Non Stress Tests (NST's) twice a week and seeing the doctor every week. That's a lot of going to the hospital! The NST is basically two monitors, well three in my case, one to monitor contractions and two to monitor the babies heart rates. You just lay there for a little over an hour and watch tv or read a book. I'm doing okay. Not good, not bad. Still having contractions on a regular basis and sometimes even when I'm not doing anything. I still take terbutalene for that as needed. I got a Rx for a lotion for my stomach today. I'm getting strectch marks (I had been doing so well!) and a rash on my stomach. It's called PUPPS which stands for something I don't remember, it's basically just really itchy and should go away when the babies come out. 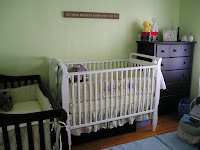 The nursery is finished pretty much. My family came down last weekend and helped Ryan put the legs on the dressers and put up some shelves. It was a bit tricky because we realized we didn't have a level, they improvised and it looks great to me! 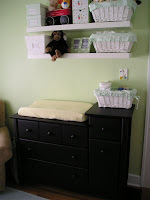 Love the nursery, and I can't wait to see it soon! I also can't believe that you're already 33+ weeks, though you can probably more than believe that you're that far along!!! So looking forward to meeting the next Wilermings!